Can you get M&B at the bookstores or your local running store? 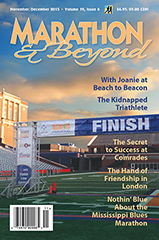 Marathon & Beyond is available in bookstores and running stores across the country. If your local bookstore or running store isn’t carrying the magazine, ask them to contact us at (toll-free) 877/972-4230.